Walking through Downtown Springfield, you’ll notice it has become a lot more colorful in the last five years. 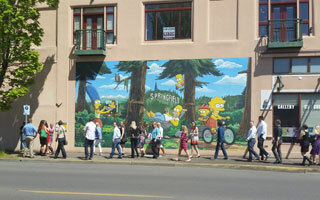 It’s due in part to the City Manager’s Office Community Art Program which spearheaded a 5-year public art plan that includes notable downtown pieces like The Official Simpsons Mural (a two-time winner of the Certificate of Excellence from TripAdvisor) and the Ken Kesey Mural. The program also established public art pieces throughout the community such as the 65-foot-tall Springfield Flame, which welcomes visitors to the Gateway area of Springfield and is currently the largest public art piece in Oregon. Additionally, the Vietnam Veterans Memorial, and the Oregon Women Veterans Sculpture located in the Mohawk neighborhood is one of only a handful of sculptures in the United States dedicated to women who have served in combat. These projects are possible thanks to the vision of our Council and to funding from Transient Room Tax, Urban Renewal, grants, and private sector partners. 2019 marks the launch of a new round of public art installations planned through 2023. New art initiatives include decorative crosswalks in Downtown Springfield. These new crosswalks will bring safety and high-end design elements to downtown. Work is already underway to bring these artful crossings to life. East Springfield will have a refreshed, artistic entryway sign welcoming people into our community. The sign was originally scheduled for replacement in 2010 to coincide with the City’s 125th anniversary celebration but was put on hold due to funding constraints. Approximately 9,000 cars drive past the sign each day! We also have our sights set on developing a “Welcome to Downtown Springfield” mural on the Fry and Rankin Building, which serves as a first look at Downtown Springfield. The proposed project includes a redesign of the existing landscaping to create an engaging entry to Downtown Springfield. Additional art includes a timber heritage sculpture and a Steve Prefontaine Memorial Statue recognizing the one-time Glenwood resident. We’ll work on an art plan for Glenwood in the future that takes into account public buildings and transportation improvements planned for the area. We’re excited to continue adding to Springfield’s public art and have been impressed with the level of visitors these sites bring to our community.